Samsung’s Galaxy A-series is positioned between its affordable J-series and the flagship S-series of smartphones. This translates into phones that have better hardware and build compared to the J series of phones and a few features that have tricked down from the S-series. The latest addition to this lineup is the Samsung Galaxy A9 (2018) which sports four cameras at the back, stacked one below the other. This also makes it the first smartphone to sport such a setup. We spent some time with the new Samsung Galaxy A9 (2018) at the sidelines of the global launch event in Kuala Lumpur and here are our first impressions of the device. From the front, the Galaxy A9 (2018) looks a lot like the Galaxy A7 (2018) but it is, of course, slightly bigger. The front is dominated by a 6.3-inch Super AMOLED display that sports full HD+ resolution and an 18.5:9 aspect ratio. It has good contrast levels and viewing angles and was pleasant to look at in the brief time we spent with the device. Samsung calls it the Infinity display but the display does not wrap around the sides like the one on the Galaxy S9 (Review) and the Galaxy S9+ (Review) do. Samsung has opted for 3D curved glass back and a metal mid-frame that give the Galaxy A9 (2018) a premium in-hand feel. 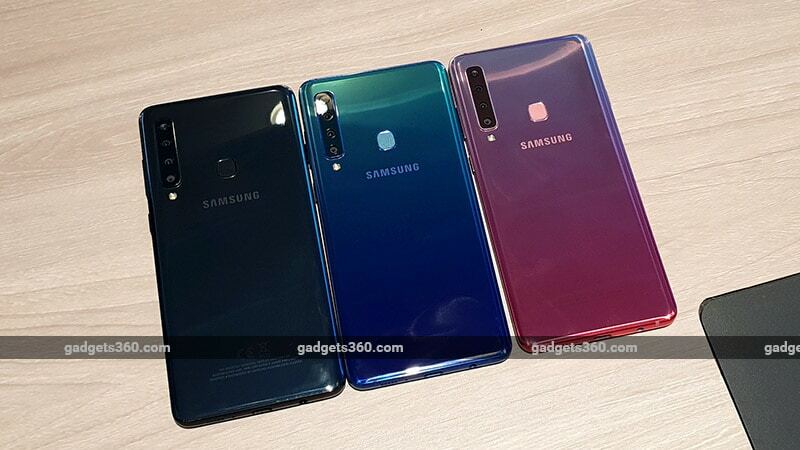 The Galaxy A9 (2018) will be available in three colours — Lemonade Blue, Bubblegum Pink, and Caviar Black. Except for the last colour option, the other two have a slight gradient which is becoming increasingly common and we have seen it on phones like the Huawei P20 Pro (Review), Honor 10 (Review), and the Oppo F9 Pro (Review), among others. These finishes do look good and will definitely appeal to those who prioritise looks when buying a smartphone. The power and the volume buttons are on the right of the device and you will need to shuffle the phone in the hand to reach them. The Samsung Galaxy A9 (2018) also has a dedicated Bixby button on the left side which is a first in the A series. We saw the introduction of the side-mounted fingerprint scanner on the Galaxy A7 but with the Galaxy A9 Samsung has opted for a rear-mounted fingerprint scanner. We liked the placement as it was fairly easy to reach. Turn the device around and the quad-camera setup stares you right in the face. The obvious highlight of the Galaxy A9 (2018), it consists of four different camera sensors, designed to shoot in different conditions. It has an 8-megapixel wide angle sensor at the top with a 120-degree wide field of view and f/2.4 aperture. The 10-megapixel sensor with the telephoto lens with 2x optical zoom is next in line. Below it are the 24-megapixel primary sensor with an f/1.7 aperture and the 5-megapixel depth sensor with an f/2.2 aperture. All this is backed by an LED flash. The primary 24-megapixel camera uses AI when in the scene optimiser mode and can distinguish between 19 scenes. It also does 4-in-1 pixel binning in low-light to help the lens capture more light. Like most other smartphones with a depth sensor, the Galaxy A9 (2018) also uses it when clicking bokehs. You can set the level of blur you want and even refocus after the shot is taken. The Galaxy A9 also has a 24-megapixel selfie camera that also undertakes face-recognition duties to unlock the smartphone. We couldn’t test the camera performance of the smartphone in the short time we had with it, but we are looking forward to putting it to the test in our full review. Powering the Galaxy A9 (2018) is the Qualcomm Snapdragon 660 SoC, an octa-core processor with four cores clocked at 2.2GHz and the other four cores clocked at 1.8GHz. It is a fairly powerful processor and we have seen it powering phones like the Nokia 7 Plus (Review) and the Xiaomi Mi A2 (Review). The smartphone will be available in 6GB RAM and 8GB RAM variants while the internal storage remains constant across the board at 128GB. The phone does have a dedicated microSD card slot which helps expand storage further up to 512GB. The Galaxy A9 (2018) is a dual-SIM device that has two Nano SIM slots. In terms of connectivity, the device supports Bluetooth 5.0, dual-band Wi-Fi 802.11 ac, GPS, GLONASS, and NFC for Samsung Pay. The phone has a 3800mAh battery with support for fast charging via the USB Type-C port. It also includes an accelerometer, gyro sensor, geomagnetic sensor, and a proximity sensor. Samsung ships the phone with Android 8.0 Oreo with its custom Experience 9.0 UX on top. With devices gearing up for Android Pie, we feel Samsung should’ve at least offered 8.1 Oreo out of the box. With that said, you’ll find yourself at home if you have used a Samsung smartphone recently. Samsung has customised the UI heavily and it is slightly different than stock Android. Like other Samsung smartphone, you do get quite a few apps preinstalled. Samsung has priced the Galaxy at EUR 599 (which is roughly Rs. 51,300) and GBP 549 (roughly Rs. 53,700). The Galaxy A9 (2018) price in India has not been announced but we should know that soon as the phone is set to launch in India sometime in November. Pricing and the effectiveness of the quad-camera setup will be crucial for the Galaxy A9 (2018) to make a mark for itself in a market that's pretty competitive. Disclosure: Samsung sponsored the correspondent's flights and hotel for the launch event in Kuala Lumpur. product Samsung's latest Galaxy A9 (2018) is the first smartphone to sport a quad-camera setup. Read our first impressions of the device.